The death of Intel’s ‘Tick-Tock’ means that Kaby Lake is Intel’s third crack at their 14nm process. 14nm started with Broadwell (5th Gen, tick), introduced a new microarchitecture with Skylake (6th Gen, tock), and now is in the ‘optimization’ stage with Kaby Lake (7th Gen). This means an improved ‘14nm Plus’, offering better power efficiency and higher frequencies through a less strained transistor floorplan. Intel is launching a myriad of SKUs under Kaby Lake, ranging from mobile KBL-U at 15W and 28W through mobile KBL-H at 45W and desktop-class KBL-S at 35W to 91W. 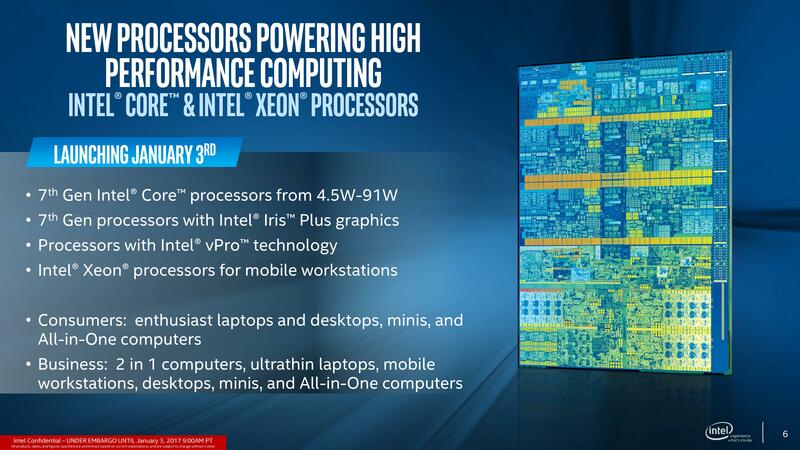 This includes three overclocking SKUs for desktop, including an i3 variant. Here’s the front page of AnandTech’s Kaby Lake launch coverage. Despite what has been released elsewhere on the internet, today marks the second official launch of Kaby Lake, the first being back in September with six mobile processors which currently feature in the premium notebook and mini-PC categories. As a ‘trial run’, these six processors have shown promise and as a result another 25+ are coming to the wider market. The main features for Kaby Lake includes support for Optane Memory, a range of new 200-series chipsets to support the processors, an update to the Gen9 graphics featuring Main10 support and other lower power hardware accelerated video playback, as well as adjustments to the underlying silicon to afford a better voltage frequency curve. Intel’s ‘Tick-Tock’ cadence has disappeared, as we’ve reported on several times previously, and Kaby Lake is the first wave of Intel’s ‘Optimization’ step in their ‘Process, Architecture, Optimization’ release structure. The goal of the first two steps in that trio have been well documented over the last decade or so of Intel releases: a process change means a shrink in the minimum feature size of the silicon (and arguably represents the main business focus of Intel’s R&D), such as from 90nm to 65nm or 22nm to 14nm, and ‘architecture’ indicates an improvement to the underlying microarchitecture, typically taking advantage of the new process in the previous step. Both of these steps, barring a significant paradigm shift in the microarchitecture, have yielded 5-15% performance jumps each iteration. Also, based on yield, typically the smaller chips are the ones to come to market first. The Optimization step is a relative unknown, as the term is somewhat definable in many different contexts when it comes to semiconductor design. Optimization could be an adjustment to the base microarchitecture giving it more support, or an adjustment in the silicon manufacturing process giving better efficiency, or it could be a different set of SKUs for a changing market, or it could be an updated internal graphics implementation. There are many ways in which Intel could play the optimization card, and for the launch of their 7th generation processors, it comes across as a number of features. At this point I should mention the Devil’s Canyon launch of the i5-4690K and i7-4790K, which were out-of-cycle launches of new overclocking products. While Intel marketed this as an ‘optimization’ of the current design, it technically wasn’t part of the PAO cadence. Most of the Devil’s Canyon optimization was around heat management rather than any other significant shift, whereas the ‘Optimization’ label for Kaby Lake is an actual physical change to the silicon. The first one to make note of though, to which our readers are probably most interested, is that while there is a change to the silicon, there is no underlying change to the microarchitecture. As a result, Intel are not promoting any performance difference with the previous generation (Skylake, 6th Gen, SKL) at a given frequency. They are however promoting better efficiency, which means that it should do the same at lower power, or offer better points in the voltage frequency curve. The motto should be ‘do more with less’. 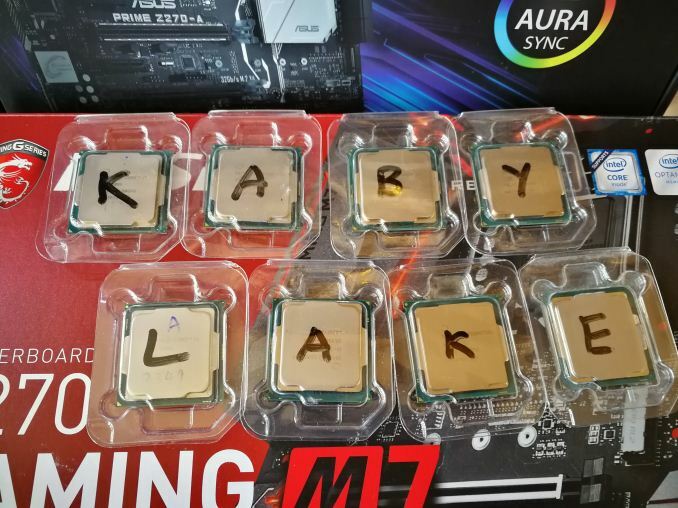 As we’ll explain in this piece, similar to the six processors launched back in September, the main benefits for Kaby Lake over previous generations of Intel CPUs will be in the feature set, and to liven things up, what SKUs are on offer. The Y series, using the Core m3, Core i5/i7 and Core i5/i7 vPro nomenclature, are the 4.5W dual-core processors with HyperThreading that are focused on small and light mobile PCs, such as 2-in-1s or premium lightweight laptops, or Compute Stick-like devices. The reason they get so low in power is often due to their super low base frequency, and with such a low TDP rating this enables these processors to be placed in laptops and have a good chunk of battery removed to save weight but still offer decent battery life. The U series are at the 15W and 28W mark, still offering two cores with hyperthreading, but with a much higher base clock. These are often cheaper than the Y-series as their voltage/frequency profile does not need to hit such a stringent set of requirements, and these are the parts users will likely see in cheaper designs, or premium gaming notebooks that are not so thick. Some of the U series parts will use an additional on-package chip called eDRAM, either 64 MB or 128 MB, which will act like a transparent DRAM buffer to main memory. This mostly affects graphics performance, and these parts will fall under the Iris Plus branding. The eDRAM use model, as we’ll re-explain in a bit, is different to previous generations of Intel’s eDRAM. (Astute users will note that this is Iris Plus, rather than just plain Iris or Iris Pro as in previous generations. Intel made clear in our pre-briefings that there will be no Iris Pro products at this launch (which isn’t to say there will not be in the future), however as things stand Iris Plus will be the branding on KBL-U series products that use eDRAM. No exact reason was given for the change, except that it will help differentiate between Skylake parts with Iris grade graphics, but whether this is enough of a reason to adjust the branding remains to be seen). The H series processors are mobile soldered (BGA) parts that tip the TDP scales at 45W, and the goal of these parts is to provide the top performance to mobile devices that require it. 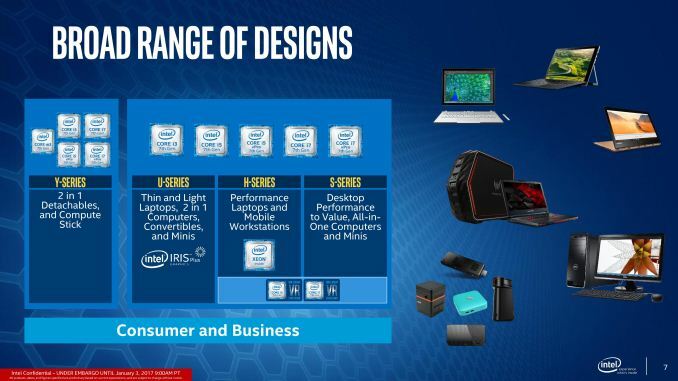 Intel is keen to promote the H-series under its new ‘VR Ready’ branding, indicating that these processors in the right devices will have enough grunt for virtual reality systems that have suitable graphics. The H-series will be wide ranging in parts and performance, as well as bringing in mobile workstation-class Xeon processors. The S series are the socketable parts for desktops. Just a reminder, that’s ‘S for deSktop’. For users following the desktop line of processors, there is nothing particularly out of the ordinary here to start. Three i7 parts with four cores and hyperthreading, one of which is unlocked and one is low power, followed by a few i5 quad-core parts that have the same trend of unlock and low power, as well as some dual-core with hyperthreading i3 parts. Two things stand out from the new KBL-S release segments. First is a new part of the stack that comes unlocked and is therefore overclockable: the Core i3-7350K. This is a dual core CPU with hyperthreading, a 60W TDP, comes with a 4.2 GHz base frequency (there’s no turbo on an i3), and the multiplier is adjustable. Certain segments of the enthusiast community have been asking for an unlocked Core i3, to bring overclocking back into having its original meaning of boosting a low-end CPU into performing like a high-end CPU, and this Core i3 will finally answer that question. We have a full review of the Core i3 as part of our Kaby Lake launch series, even though the formal sale date for the i3-7350K is early February. The second stand-out part is the lack of desktop Xeons being announced, what would be the E3-1200 v6 line of CPUs, as well as the lack of dual-core Pentiums or Celeron parts for the super low-cost segment in the market. The v6 parts, assuming the strategy would follow from the v5 parts, would require a new Xeon-specific chipset for motherboards and no C-series desktop chipset is being announced today. I highly suspect that the Xeon CPUs will be announced later in Q1, given that the target market for these is a little different to standard desktop processors. "Calculating Generational IPC Changes from Sandy Bridge to Kaby Lake"
The performance improvement from Skylake is minimal. If Skylake wasn't enough to upgrade, then Kaby lake won't be either. If you have a 2600K, especially overclocked, then you are better off buying other improvements - such as SSDs or better video cards, which you can still take along whenever you do upgrade. You completely missed the sarcasm in Mr Perfect's post. And as far as upgrade strategies go, it basically always comes down to what your wallet can handle and its not black and while 2x perf. increase.